PXT Select™ is a new, easy to use online hiring assessment that makes hiring simpler and smarter. PXT Select will help you select and compare the best candidates for your organization. Join us this month to continue your discovery of PXT Select . Last month we covered the history and methodology used to develop PXT Select and how it helps you get a clear picture of a candidate’s verbal skill, verbal reasoning, numerical ability, numerical reasoning, behavioral traits and interests. All 9 PXT Select reports available for one price! The training available for your team so you can get started right away! PXT Select Part 1 was held on June 15th. If you missed Part 1, we’ll be happy to send you the recording to review. Simply send your request through our contact form. “PXT Select” is a trademark of John Wiley & Sons, Inc.
At times, the world of medicine can be affected by miscommunication, which in turn has proven to be detrimental to some patients and even fatal to others. This problem is propagated by way of poorly inscribed and mistakenly interpreted medical abbreviations that lead to misdiagnoses, inaccurate prescriptions and incorrect administration of medical dosages. Because the expanding world of medicine has become very compartmentalized with new fields of study and specialization, many of the abbreviations and acronyms do not translate from one field to another, from one department to another and from one practitioner to another. The Corexcel Online Medical Terminology Course is designed to update those currently active in a medical vocation and to prepare future medical professionals to use medical terminology correctly and to be aware of the top abbreviations that are misused — the exact acronyms and abbreviations that, when misused, result in negative outcomes. An example: In the instance of a doctor prescribing “10U” meaning that the patient should take 10 units per medication interval, the typical misreading would be “100.” This would put the patient in danger of taking a dose that is tenfold the prescribed amount. In the instance of a highly toxic painkiller such as Vicodin or Oxycodone, the results could be lethal. As benign as it may seem at face value, unreadable abbreviations and misused acronyms can result in unfortunate outcomes. According to The Joint Commission Journal on Quality and Patient Safety, it is estimated that clerical medication errors account for some 7,000 deaths per year, 81% of the mistakes occurring during the prescribing stage of the medical process. The source above also reports that doctors are responsible for 78.5% of abbreviation errors, with nurses sharing 15.1% of the burden while a mere 6.4% of inaccuracies were penned by pharmaceutical or other staff. • A doctor prescribed a hydromorphone epidural for a patient, writing the script as “2 µg/mL.” It was then misunderstood by the pharmacist who labeled and prepared the patient’s prescription as “2 mg/mL.” The pattern continued with the attending nurse, who misread the label and subsequently administered a dose with a 1,000-fold variance. The patient soon experienced difficulty breathing, was intubated and placed on mechanical ventilation along with being given additional pharmacology and chest compressions to mitigate a diminishing cardiac function. The epidural was removed and naloxone was used to reverse the toxic effects. • An acyclovir treatment was ordered for a 62-year-old patient on hemodialysis. The order read “acyclovir (unknown dose) with HD.” The practitioner who read the order interpreted the “HD” abbreviation as TID — meaning three times daily. Acyclovir is given intravenously, and then only once daily after hemodialysis taking into consideration the patient’s renal impairment immediately after dialysis. In this case, the patient received three doses over a two-day stretch, resulting in mental deterioration and subsequent death. • Mid-sternal chest pain in a 53-year-old patient was diagnosed as a gastrointestinal malady. As a result of this assessment, an “MDX/GI” cocktail was prescribed — which is a compound consisting of Xylocaine® (lidocaine), Mylanta® (aluminum hydroxide, magnesium hydroxide, and simethicone) and diclomine. The patient developed labored breathing followed by respiratory distress, requiring an administration of epinephrine to reverse the symptoms. Although the patient’s allergy to lidocaine was documented, the attending physician and nursing staff were unaware that lidocaine is a key ingredient in the MDX/GI cocktail. No matter the outcome, each case strongly supports the critical need for an ongoing education in medical terminology and a system that strives toward consistency in usage of medical abbreviations. Consider the remaining 6,997 cases involving similar situations that were propagated by abbreviations that were either misinterpreted or poorly written. The obvious solution would seem to be to discourage the use of the medical terms most frequently responsible for patient harm, yet doing so in a cohesive way across the breadth of all medical professions has proven to be very difficult. Because not all practitioners have or are required to comply with a universal set of guidelines where medical abbreviations are concerned, the responsibility by default in affecting clear communication, then falls upon the shoulders of the individual medical practitioner. Corexcel’s Online Medical Terminology Course empowers aspiring and practicing medical professionals to take control of their role in the chain of communication, be it as an attending physician, nurse, pharmacist or other vocation within the medical community. In the wake of rapid medical advancement, diversification of specialties and development of new fields of study, medical professionals can equip themselves with a comprehensive understanding of terminology, abbreviations and the most commonly miswritten and misinterpreted of both. By doing so, the results of poor communication can be diminished. If you’re looking to strengthen and improve your communication in the medical field, contact Corexcel to learn more about our online medical terminology course. The more you learn about using and identifying the proper medical terms, the more effective and accurate you will be in preventing harm on future patients. *Brunetti, Luigi, John P. Santell, and Rodney W. Hicks. “The Impact of Abbreviations on Patient Safey.” The Joint Commission Journal on Quality and Patient Safety 33.9 (2007): 576-80. Joint Commission of Accreditation of Healthcare Organizations. Sept.-Oct. 2007. Web. May 2017. Whether you are a veteran or new to the managing scene, anyone that deals with running a team know that managing people is no simple task. More than 60% of new managers fail within the first year and over 70% report they do not get what they need to be successful in their role. This is not only stressful for the managers but the employees as well. Bad management can cause employees to feel under-appreciated, frustrated and stressed out, leaving them uninterested in their work and looking for a way out. Our May webinar, “DiSC Profile: Avoid 5 Management Mistakes,” outlined five classic management errors to avoid, and detailed new skills you can immediately implement to improve your company culture and increase retention. DiSC Profiles offer strategies to understand your own management style, your teammates’ personalities and finally how you can use this information to better motivate and develop your team. It may sound obvious but all too many managers don’t have a firm idea of their own management style. The first step to being an effective leader is developing an understanding of your own personal motivations as well as individual strengths and weaknesses. What kind of manager are you? There isn’t one personality mold that fits all managers. What works for the fast-paced and strong willed manager might not work for the analytical and systematic. Learn which of these four DiSC profiles most closely aligns with you and how your management style fits in your team. When you look at your team what do you see? If you are honest, you have probably neatly categorized and labeled them in your head. But do you really understand your team members on a fundamental level or have you sold some people short? Don’t fall into the trap of defining someone by what you believe they can do. Learn what makes them tick and what motivates them so you can support them in reaching their full potential. Everyone on your team has different personalities, working styles, and needs. As a manager, it’s your job to work with those differences. Some people may need more encouragement, some more direction, while others may need a greater challenge. By better understanding their personalities you will be able to guide instead of just define them. Unclear direction can be a large stumbling block when it comes to how your team performs. Your team wants to succeed and to deliver what is expected. Though problems can arise when there is a disconnect between your expectations and what your team thinks you expect. Each team member will process and take direction differently. A key factor in their performance is their individual personality style. The team member with a D (Dominance) personality, for example, is driven, works fast and asks a lot of questions, which can be perceived as challenging. How do you direct and delegate this team member? Well to answer that question you need to understand what motivates them. A person with a D-personality is highly result-oriented, so when giving direction it is best to show them the “big picture” purpose of a task as well the potential successful outcomes. If they have proven themselves in the past, show them that you respect their abilities. Give them a little more autonomy, but make sure you see eye-to-eye on the goal of the assignment and the consequences of shortcuts. Harmony, acceptance, action, facts…. What if people had their needs written all over them? It sure would make it easier to give people the support they needed in the workplace. As that is not the case, many managers are left at a loss when it comes to how to best support their team members. With DiSC profiles, managers can better understand what their team members need to thrive. For example, a team member with an S (Steadiness) personality, needs harmony and stability, and conversely, fears rapid change and letting people down. For this particular style, being in chaotic situations, or being forced to improvise or deal with cold or argumentative people is stressful and demotivating. How can we go about creating a motivational atmosphere for this personality? Make sure they have ample time to achieve results, even if it means slowing your pace down a bit. Additionally, be sure you provide the structure and security needed for her to feel comfortable and when changes are coming make sure you plan ahead to be able to give her plenty of warning. Other personalities will have varying needs, but understanding these needs is the first step in creating a supportive environment and a harmonious workplace. Make sure your feedback counts! As you begin to develop a better appreciation of the different working styles, you’ll learn how to approach them individually. Listening, encouraging and helping particular styles are just some of the ways you can deliver the proper response they need to help motivate them. Once you have a thorough understanding of your team member’s value in the workplace, you can respond with constructive feedback that they can successfully utilize to achieve their goals. DiSC is about helping you as a manager develop a better understanding of yourself and your team so you can ultimately help them unlock their potential. If you see yourself falling into these patterns of mistakes or simply want to become a better manager, applying DiSC Profiles can help get you started on the road to success. It starts with understanding who you are as a manager and how you can learn to better support your team among the different working styles. Everything DiSC Management is the ideal tool to help improve your management skills and ultimately, your company culture. Can you benefit from using the research-validated online profile assessments like DiSC? Corexcel can provide the tools and training you need to use for creating a more cohesive workplace. For a recording of this webinar or to get additional information on Everything DiSC Management or other Wiley DiSC profiles, Contact us to learn more about getting started on your DiSC Profile journey today. The pressure to make the right hiring decision can be overwhelming for many managers. Not only must you ensure that the new hire has all the right skills for the job, but you need to be confident that they can successfully integrate with the existing team. When your employees don’t get along, it can affect the performance of everyone in the office. How can you get insight on whether or not personalities will be in conflict? This is why many companies turn to the DiSC profile assessments. This simple test assigns individuals to four basic personality categories. The results provide information on how these personality types can best work together in your office environment. Let’s take a closer look at the way you can use DiSC profiles when hiring and onboarding new employees. What Makes DiSC the Right Choice? 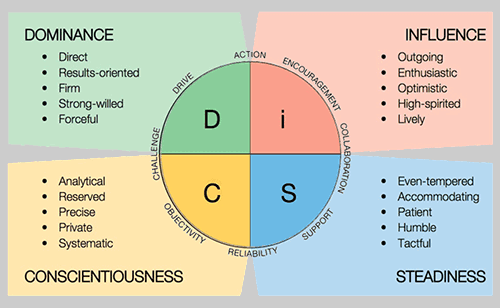 Unlike some of the more complicated personality profile tests on the market, DiSC is easy to take and easy to understand. The results assign four basic personality traits, as well as secondary traits to each of your team members. You can use this information to determine how each person on your staff may communicate with one another while handling conflict, staying organized, and optimizing productivity. For this reason, many companies are turning to DiSC profiles for their ease of use and overall value. When Should You Use the DiSC Profile Test? We recommend using the DiSC profiles to help you during the hiring process. Once you have determined that the individual fits all the requirements for the open position, administer the test to gain insight on how they will work with others on your team and their personal effectiveness in the workplace. Using these insights, you will be able to better understand their areas of strengths and weakness, and where you can help them grow. Each initial of DiSC stands for a specific category of personality traits. You can begin to see patterns in behavior with your employees to better understand how someone with any given trait will fit in with the team. For example, putting an individual with a D style in a department where the primary personality trait is C could lead to misunderstandings if they aren’t managed correctly. The individual with a C style may feel steamrolled by the person with a D style. They may both benefit from also collaborating with an I style personality. Using this information to develop departmental structures can help everyone work together in a cohesive way. The knowledge gained from learning how your new employees will work together with your staff can help integrate them into your office culture in a more seamless fashion. Can your organization benefit from using the research-validated online profile assessments like DiSC? Corexcel can provide the tools and training you need to use DiSC for creating a more cohesive workplace, so contact us to learn more. Now that you’ve decided to enter the healthcare field, where do you start? Many experts state that taking an anatomy and physiology course is critical for long-term success. Before you decide to move forward and start an online anatomy and physiology course, it’s best to understand why this foundation of knowledge is vital to your medical career. Let’s take a closer look. It’s helpful to have an intimate knowledge of human development and how the body grows and changes throughout life. Working with children is very different from working with older adults, and a background in anatomy and physiology can help you better understand the individual needs. Beyond the individual organs and systems, it is also important to understand how the various aspects of the human body work together. The circulatory system, the respiratory system, the lymphatic system, and more all play a part in human health and the interactions can be healthy or unhealthy. By understanding how the systems interact, you can determine the proper care for each individual patient and their specific symptoms. With a foundation of anatomy and physiology, you will have the building blocks to make the proper decisions and provide accurate and quality care. Of course, the study of anatomy and physiology is not static. New innovations in science and medicine change our understanding of the human body all the time. Starting with the proper foundation provided by an anatomy and physiology course is a stepping-stone in continuing an education in the medical field. Once you have an understanding of the basic systems and functions of the human body, staying up to date on new research will be significantly easier. Online courses, taken at your own pace, can give you the tools you need to better understand these concepts. Ultimately, your medical career will be reliant on your ability to learn and execute tasks with precision. With a greater understanding of the way the systems of the body interact, a medical professional will be able to successfully determine the problem and conclude a more accurate solution. There is a range of potential career opportunities for someone with a strong background in anatomy and physiology, from clinical work to laboratory research. These fundamental building blocks of medical science will give you the opportunity to make a difference in the lives of others throughout your career. Beginning your healthcare career can be intimidating but starting with a foundational understanding of anatomy and physiology will broaden your educational and career prospects in a fast-growing field. Do you want to take anatomy courses online to begin your journey toward a career in medical science? Contact Corexcel to learn what we have to offer. Did You Know That These Healthcare Careers Start with Medical Terminology? Medical Terminology is a basic requirement for nearly every healthcare related career path. Recognizing, understanding, and pronouncing basic medical terms, abbreviations, and more is critical for success in a clinical environment or behind the scenes support role. And medical terminology courses don’t just teach you vocabulary. You’ll learn how to break down complex medical terms concepts into prefixes, suffixes and word roots so that you can decipher them. Let medical terminology be the foundation on which to build your healthcare career. Let’s take a closer look at some careers that require this knowledge and skill. While many companies are digitizing their medical records, there is still a market for medical transcriptionists. In the past, medical transcriptionists listened to a doctor’s dictation and transcribed it into the medical record. Today, as many doctors are required to create their own records, medical transcription is evolving into medical record editing. A strong background in medical terminology is required for these roles. If you’re considering a career as a medical assistant, you should start out with a basic introduction to medical terminology. A medical assistant is usually the first person a patient sees during an appointment. They’ll take and record vital signs and medical histories. This role is a combination of clinical and clerical work, but it is necessary to understand medical terminology to succeed. If you would rather be behind the scenes, a role as a medical records clerk could be a good choice. This job involves organizing and managing health information. Accuracy, accessibility and data security are all key aspects of the job. The job may require certification or an associate’s degree, but starting with a medical terminology course can be a good way to determine if this is the right career path for you. To ensure patients are receiving the right bill for the care they were provided, medical coding and billing specialists train to better understand the requirements of providers and insurance companies. Accuracy and privacy are some of the main concerns. Medical terminology will be the basis on which you can build a new career as a medical coding and billing specialist. If you want to broaden your skill set and consider a career in the medical industry, either working with patients or in an administrative capacity, beginning with a medical terminology course is an excellent way to start. To learn more, contact Corexcel about online medical terminology courses available today. Posted in Other1 Comment on Did You Know That These Healthcare Careers Start with Medical Terminology? For many future healthcare careers, a foundation in anatomy and physiology is essential. Beginning with an introduction to the organization, structures, and functions of the human body, the Corexcel course will provide the very building blocks you’ll need to succeed. You will be able to take a closer look at common diseases, disorders, and conditions that will help you better understand the needs of patients or administration. Among the benefits of taking the Corexcel anatomy and physiology course online is the self-paced nature of the experience. Students can tailor their study to their own learning style as well as go back and review any section before taking the final test. The ability to balance learning with your lifestyle and to learn at your own pace will be critical to your ultimate success in the anatomy and physiology course. Medical Terminology – the language used to describe human anatomy and related functions. Terms are often made up of Latin or Greek root words, prefixes, and suffixes. These can be difficult to learn, so additional study support is available and encouraged. Major Body Systems – an overview and detailed study of the interconnected systems of the body and how they function. For instance, you’ll learn the cardiovascular system and the nervous system as well as how these systems work together. Common Pathologies – common diseases medical professionals face most often. While there are more advanced opportunities to learn pathology, in the anatomy and physiology course you’ll learn some of the more common conditions. Homeostasis – how the body systems work together to maintain good physical health. When a system has reached homeostasis, everything is in good working order. The anatomy and physiology course can help you spot small deviations. Effects of Aging – how each part of the body and the major body systems are affected by aging. You’ll see specific pathologies that might affect older adults to give you an idea of how to spot and treat these conditions in the future. As with any medical related coursework, additional study support to increase retention may help in your success. Some creative options include coloring books, apps for smart phones and tablets, digital models, crosswords, and additional study guides. If you are you considering taking an anatomy and physiology course and want to learn more, visit our website or call us at 1-888-658-6641. We are here to help. A course in medical coding can expand your career opportunities in the medical industry. These codes form the basis for defining patient information in health records, medical claims and outcomes reporting. Before you take a course in medical coding, it might be helpful to get a better understanding of ICD-10 and what it can mean for your career. Here are some general ideas to help you grow your career in medical coding. While online coding apps and technology are a great resource, having a physical library with codebooks and coding guidelines helps immensely. Experts suggest that coders should not become reliant on technology and that building your own resource library will provide credible sourced information at your fingertips. Knowledge on how to use coding resources will help you recognize incorrect codes. And current coding manuals are required for taking coding certification exams; electronic resources are not allowed in the exam rooms. Taking your first job in an entry-level position will help you build necessary experience to advance your career. Not only will you learn ICD-10 on the job, but you will build skills that will make you more marketable in the future. You’ll also be able to learn how the system works. By training with experienced individuals, you will be able to develop habits that will help you throughout your career. Medical coding is a process-oriented career. There will be frequent audits to ensure the company or facility is compliant with current regulations and the ICD-10 codes. Building a positive professional relationship with management will be crucial to your development. As you continue to climb the ladder throughout your career, having a good working relationship with supervisors and audit managers will help you. Collaborate with them to ensure your work is at the necessary level for their requirements. Seek out a mentor to help grow. Another helpful idea when you’re entering the medical coding industry is to work with a mentor. Seek someone out in your community who does a job you want to do. Talk with them about their career path and learn from their experiences with ICD-10, and even their mistakes. They can also become a sounding board to help you work through difficult situations. If you’re concerned, confused, or frustrated with something at your new job, get their perspective to help you solve the issue without burning bridges. Are you looking for a career where medical coding would benefit you? Kick off your future with a course in ICD-10 coding. Whether you want to learn a new skill or enhance your current professional experience, online classes can help you advance your education without interrupting your day-to-day life. But how do you ensure that you are getting the most out of your online education? Here are some ways to make the process more productive and ensure that your time and money is well spent. Establish deadlines. When you’re juggling online classes with work and family obligations, it’s easy for things to fall through the cracks or get lost in the shuffle. This is especially true when the class is self-paced. While being able to work at your own speed is an advantage, it can also become a burden if you’re not able to stay on track. Establish deadlines early on to help you reach milestones along the way. Track your own performance. In an online class you will typically receive feedback and even grades for the work you’ve done. But it’s also helpful for you to chart your own progress with your learning. Setting deadlines to reach educational milestones is only helpful if you understand what each of those milestones represents for your long term goals. Using an online calendar system to track important dates in the class can give you an idea of where you are in your understanding of the subject. Associate subjects with real life. When you learn a new concept, apply it to your life or your work for better understanding. Using new knowledge and skills is essential for retention. By connecting your education to the things you do every day, it will improve your motivation and curiosity to continue learning. Another way you can retain more information is to teach it to someone else. This will help by creating associations between online learning and real life. Develop a routine. A routine that will help you stay focused on your online classes will also help you maintain normalcy throughout your daily activities. Develop a routine that you can adhere to from the time to wake up to the time you go to bed. This will help you see how you can fit all of your tasks into the day and not feel overwhelmed with the amount of work you have to do for your family, your job, and your online classes. We provide certification courses on Business Communications, Entrepreneurship, Finance Essentials, Resource Management, Innovation & Critical Thinking, Leadership, Non-profit Management and Sustainability Management. Learn more about Corexcel’s Online Certificate Programs. What online classes can help you meet your personal and professional goals?